Three schoolgirls who fled Britain to Syria have contacted their families, confirming they are “healthy” but not planning to return home. An Islamic State commander says the girls are “naïve” and “likely” to die there. The girls, Shamima Begum, 15, Kadiza Sultana, 16, and Amira Abase, 15, made a one way journey from East London to Syria in February to allegedly join the so-called Islamic State (IS, formerly ISIS/ISIL). According to recent ITV news reports, one of the girls called her family in the UK to confirm she is “healthy, safe and well,” but she and the other girls have “no intention” of returning home soon. The two other girls contacted their family on the internet. Relatives are convinced the messages are genuine. 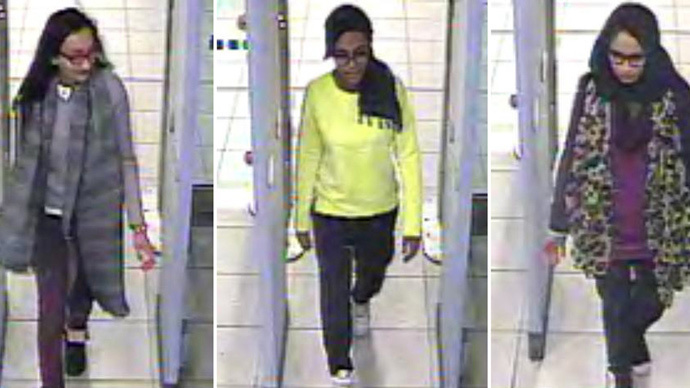 A top female ISIS commander told Sky News the three girls were “very happy” to be in Syria. She said the “naïve” teenagers “love the Muslim world” and want to learn more about it. The commander, who calls herself Um Asmah, says she was the first person to contact the foreign girls when they crossed the Syrian border. In an interview with Sky News, Abase’s father begged his daughter to come home. “Get back and remember how we love you, your sister and your brother cannot stop crying,” he said. “Many Muslim families want to inculcate Islamic traditional cultural values into their children. To do this they send their children to local mosques for regular prayers every day,” he said. Preachers offering dreams of “Muslim’s ruling the world does appeal to these young men and women who feel misfits in local British culture,” he said. This is because of “the way they are brought up and alienated from local cultural values,” he said. He said parents and Islamic centers play a “huge role” in the process of radicalization. “There is nothing wrong with being a Muslim who embraces secular British values and still follows faith,” he added. In March, Prime Minister David Cameron called for an end to youth radicalization, saying “poisonous” extremist ideology must be confronted. The struggle to prevent young people from joining Islamic State could go on for “not just years, but possibly decades,” he told the BBC. A new counter extremism bill was raised in the Queen’s Speech on Wednesday. The new bill is designed to “target the online communication of terrorists, pedophiles and other serious criminals.” Details of how it will work will be published in the coming days. A spokesperson from Stop the War Coalition told RT the best way to prevent further cases of youth radicalization is to “make a radical break with the current British policy of permanent brutal war to end UK involvement in mass human right abuses in the Middle East. “The British government’s Prevent strategy is contributing to the feelings of alienation, discrimination and frustration which many British Muslims increasing experience,” they added. The issue is being used “to stoke Islamophobia and to build the public support for the UK government’s militarist agenda,” they added.